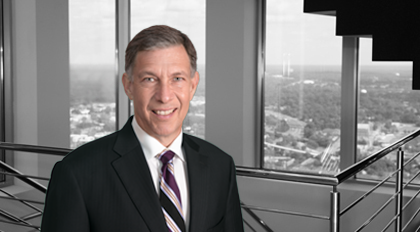 Hal Levinson is one of the senior partners in Moore & Van Allen's corporate practice. Advising business clients on strategic decisions and complex transactions is the focus of his practice. He has structured and led numerous multi-faceted transactions involving mergers and acquisitions, private equity, joint ventures and corporate finance projects. Levinson also is an experienced advisor to public and private company boards of directors. While Levinson has advised clients in a wide variety of industries, many of his clients are in the manufacturing, health care, information technology, financial services, industrial and consumer product sectors. Named Best Lawyers' 2018 Charlotte Corporate "Lawyer of the Year"
MyEyeDr., a leading sponsor-backed optometry management company, in numerous acquisitions and optometry management relationships throughout the Mid-Atlantic and Southeast. The sale by the shareholders of S & D Coffee, an industry leading coffee and specialty beverage company, to Cott Corporation (NYSE: COT), purchase price of $355 million. The acquisition by Gryphon Investors, a leading middle-market private equity firm based in San Francisco, CA, of HEPACO, Inc., a leading provider of critical environmental services on both an emergency response and planned basis in the Eastern United States. The sale by the shareholders of Strength of Nature, LLC, a leading provider of hair care products for women, to Godrej Consumer Products Limited of Mumbai, India. The sale of a successful emergency room staffing company to a growing, sponsor-backed physician management company. The sale of a southeastern based consumer finance company to a strategic acquirer backed by one of the major New York based private equity funds. The sale by Monitor Clipper Partners, a Boston-based middle-market private equity fund, to Accenture of Mortgage Cadence, a provider of loan origination software and electronic document management services in the U.S. Represented Bank of America in connection with the formation of clearXchange, a joint venture among several leading national banks to provide person-to-person payments through a network created by and for U.S. financial institutions. The investment by Monitor Clipper Partners in MyEyeDr. a multistate provider of vision care. The sale by the founders of a successful health care services company headquartered in the northeast to one of the leading international pharmaceutical companies. Guiding the orderly liquidation and dissolution of MedCath Corporation, formerly a publicly traded company, including the sale of 12 hospitals and operating divisions to many of the country’s leading profit and non-profit hospital systems. Sale of Elastic Therapy, Inc. a specialized textile manufacturer, to DJO, an international provider of medical devices and services. Sale of PMG Research to Inclinix, a portfolio company of Frontier Capital.